"Bazzi" is a 10 month old welsh pony colt. He should mature to a small (12.2 Max.) He has all the makings to be a future star! This cutie has been learning his ground manners since moving to Azure Ridge. He will lead, stand to be groomed, vacuumed, and blow dried. He is UTD on deworming and has been getting his feet done on a regular basis. (Which he is very good for!) He would be a great companion while he grows up and then should be an easy project with his sweet personality. "P Diddy" is an adorable green medium pony gelding standing 13.1 ½. This handsome boy is just starting his training, he lunges in tack and will walk with a rider. He has very flat hunter movement and impressive scope. He would be a great project for someone looking to make up a nice hunter pony for the division. His price will increase with training. "Daddy's Promise" Is available for lease. Prism has over 10 years of showing experience in all three rings. She's sure to be in the ribbons with her beautiful movement, auto lead changes, and great jump. 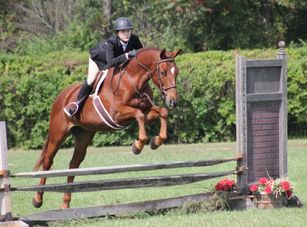 She's won many year end awards on MHJA and HJAM, and qualified with Kayla for both the MHJA Young Rider's Medal Finals and HJAM Limit Junior Medal at Horse Show's by the Bay. She'll take care of beginner riders and is a perfect match for the more serious competitor looking to win! "Corona" is available for lease. 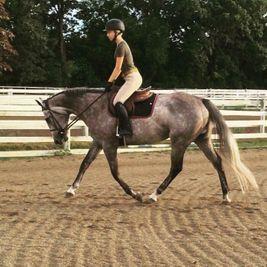 This sweet gelding is a 16.1 Canadian Warmblood with experience showing up to 3'3 in the Hunters and Equitation. Corona is perfect horse for someone looking for a gentle partner to learn how to show with! He has a cute trot, smooth canter and tidy jump. This horse is a push ride every day, and loves to cuddle and be groomed. We would like to keep Corona at a 2'6 or under job to keep him comfortable and happy. "Revival" is a 12 year old registered Thoroughbred gelding. He stands about 16.1 and is a very solid build. He is very bold and brave- will jump anything in front of him. He has the BEST personality. This horse knows how to work in a frame and has great lead changes. Wyatt has experience showing from 2'-3' and is ready to show! "Paparazzi" is a 6 year old German Warmblood standing 16.3. This gentle giant is a complete sweetheart, and has the most willing disposition of any baby I've ever worked with. He has beautiful movement, and is quiet under saddle. He is jumping around small courses with the scope for more, and has started learning his lead changes. His price will increase with training and show experience. 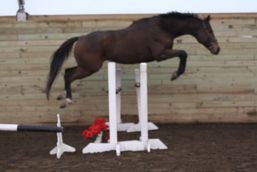 "Desiigner" is a 7 year old branded Zweibrucker mare we are pleased to offer for sale. 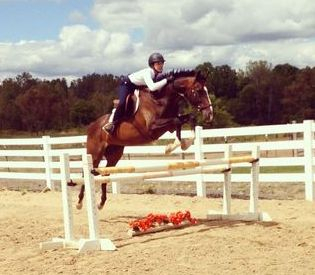 Originally bred and started in Dressage, she started her hunter training last spring. 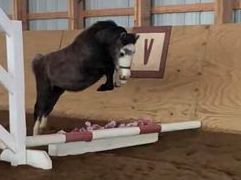 This mare has a huge step, great trot, and plenty of scope. Unfazed by the chaos of shows, she is sure to be a future star. She showed baby greens last summer and has stepped up to the 3' ring this season. Up to date- registration & passport in hand. "Bravado" is a 12 year old registered Thoroughbred gelding standing 16.2. This boy knows how to preform! 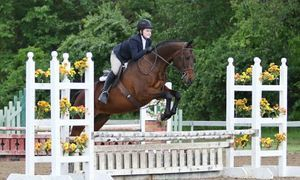 He has show miles in the hunters, jumpers, and equitation up to 3'6 and has qualified his last two riders for their MHJA medal finals. Great lead change, no spook, huge stride and will jump from anywhere! A beautiful horse looking for a new partner. Recent show video available. "Noteworthy" is a registered Quarter horse gelding. This horse has a puppy dog personality, and is a complete joy to have in the barn. 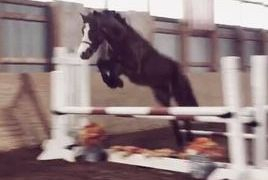 He has cute jump and adorable trot, with no naughty habits. He will always try his hardest for you! Show experience up to 3' in the Hunters and Equitation, this handsome boy is ready to win for you! 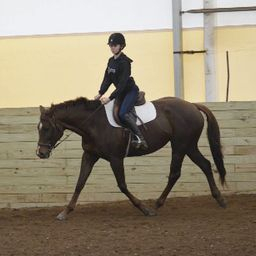 Cinder is a 6 year old thoroughbred mare standing about 15.3, should mature over 16h. 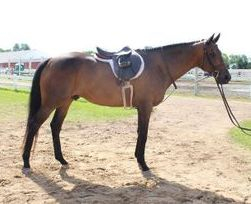 This mare is very sweet, and goes Walk, Trot, and Canter nicely in a happy mouth snaffle. Cinder has great movement, a sweet personality, and is very brave. 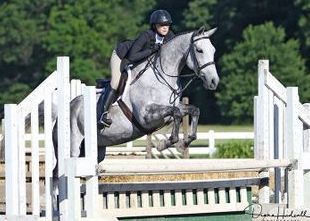 She is lightly started over fences and has been hauled off property to get the experience of a busy horse show venue. Cinder is for sale to make room for new boarders. She is a future superstar! "Rizzo" is a 5 year old registered thoroughbred gelding. Standing at 16.1- he is tall dark and handsome! Rizzo is very quiet, no spook with a great mind! 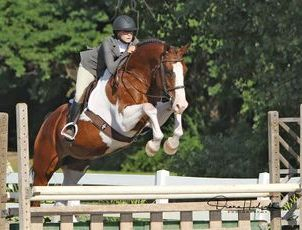 Is just starting out in his showing career but shows tons of potential as an upper level mount. "Riddles N' Rhymes" is a 8 year old registered thoroughbred mare. 15.1h with show experience up to 2'6 on MHJA with her junior rider. Ridley goes Walk, Trot, Canter nicely- swaps her leads with no spook. She's an easy keeper with no maintenance. Cute mover- rides on the buckle.